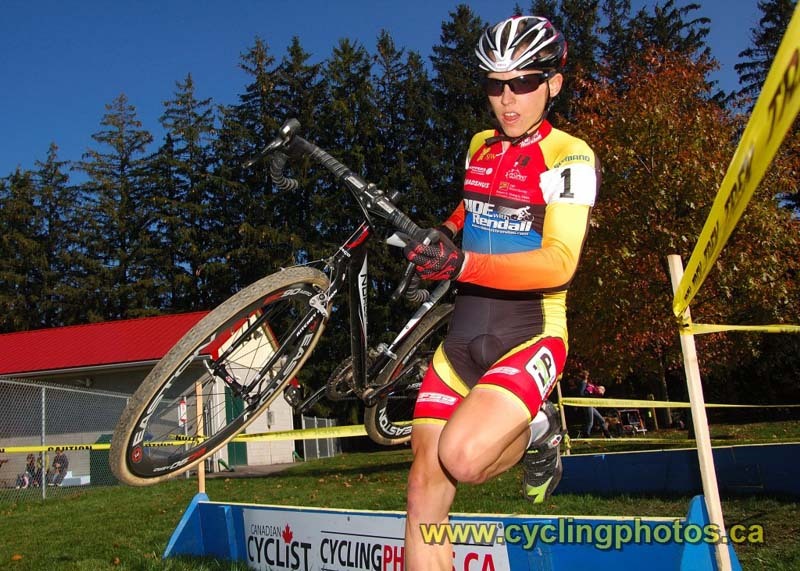 Midhurst Station – On a beautiful Indian Summer day, Laura Bietola (3 Rox Racing) and Jared Stafford (Ride With Rendall) won their respective divisions at the 5th annual Barrie Cyclocross race. 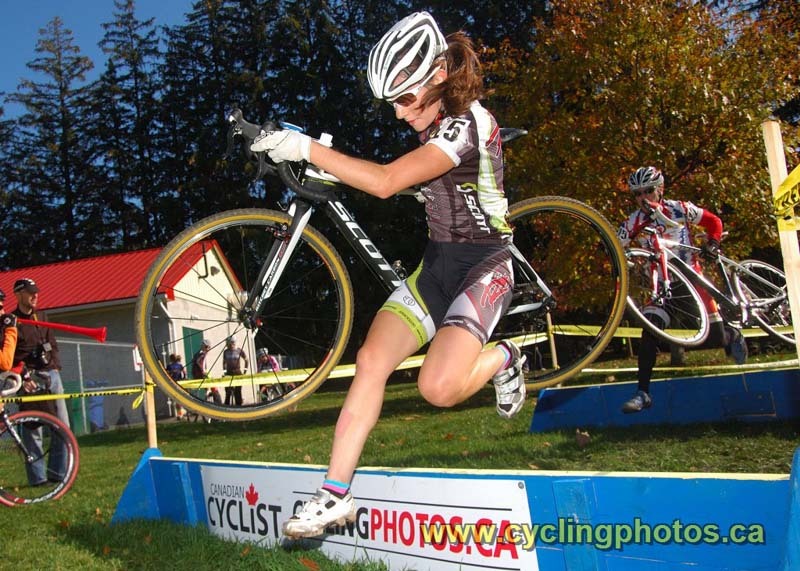 The eighth stop of the Southern Cup ‘cross series featured a flat but tacky three-kilometre course that allowed for high-speed racing under sunny skies. Julie Marceau (Lapdogs) got the holeshot in the senior women’s race, but had Bietola, Leigh Hobson (The Hub) and Briana Illingworth (True North) for company. Riding her brand new Scott CX for only the second time, Bietola quickly set about establishing herself at the head of affairs. “I was behind Leigh Hobson for part of the first lap and I attacked her halfway through and led the race from there” she recounted. After Marceau was unhitched from the chase pack, it became a two versus one battle, with Hobson and Illingworth keeping Bietola in their sights while battling each other at the same time. The struggle continued for the duration of the race, with numerous position changes. On the final approach Hobson nipped ahead and held off Illingworth in the sprint. The senior men’s race also featured a two-horse battle, but this one was for the win. Nathan Chown (Team CF) blasted off the line but was quickly caught and passed by Stafford, Zach Hughes (Norco Factory) and Erik Box (Nativo/Devinci). Mark Batty (Spidertech) reeled off the fastest lap of the race in order to join the leaders on lap two, but the effort proved costly as he faded the next time around. Box too lost contact and it was Stafford and Hughes in front and pressing their advantage. “Zach and I were feeling strong today, so with us being teammates on the mountain bike we were willing to work together and get a bit of a gap” explained Stafford. By the race’s midpoint Watson was in third, but was unable to close the gap to the leaders. “For a while there it looked like Andrew was going to bridge back up so me and Zach started taking harder pulls and keep that gap open” revealed Stafford. At the front Stafford began applying the pressure and his breakaway companion began suffering the consequences. “He just slowly went away” said Hughes, “and I had a bit of a knee issue and then he had me maxed out. He had me pretty good at the end there.” Hughes admitted to having “weak knees” and said he would skip the next race in order to rest. • Adam Jamieson of Barrie rode through the entire Master 2 Men’s field on his way to winning the Junior Men’s race. • This was the fifth consecutive year the Barrie CC has organized a ‘cross race, and the second “Baseball” edition held at the Barrie Sports Complex. According to race director Robb Meier, the facility is perfect for ‘cross. • The Southern Cup returns to the Barrie area next weekend with a race at Hardwood Ski & Bike. 3 Edgars Apse (Darkhorse Flyers ) s.t.